Madison Gardens community is sold out and is not in active development by builder. If you are interested in Madison Gardens or similar new home communities, contact us today! Our agents are very familiar with new and newer construction in Chesapeake, and can identify resale opportunities in Madison Gardens, as well as builder inventory available in nearby or similar communities in Chesapeake. To view 11 more pictures, interactive maps and the full, detailed description of the Madison Gardens community, please Login. 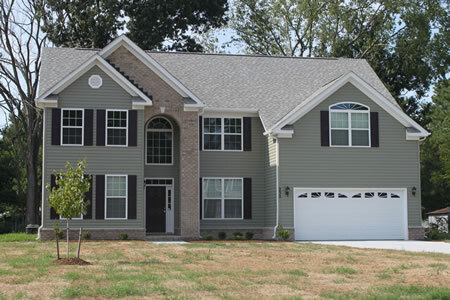 New construction homes in Madison Gardens/Savanna Heights offers real estate with stylish features. Houses for sale in this neighborhood are attracting loads of attention and anyone can see why. This cluster of contemporary homes is located in Chesapeake, VA, in the highly coveted Hickory school district. Service members won’t face hard commutes to military bases like NAS Oceana, the Coast Guard Finance Center or Naval Support Activity Northwest Annex. These houses for sale practically beg residents to come home with their welcoming exteriors. Each of the new construction homes in Madison Gardens/Savanna Heights comes with concrete patio, two-car garage, foundation with crawl space, aluminum gutters, garage service door, professional landscaping complete with sod in front yard and more. Real estate with so much on the outside is off to a great a start. From the moment prospective homebuyers step into these new construction homes, they can notice the difference. Properties here are built with a high code of real estate standards and it shows in every detail. Each of the houses for sale in Madison Gardens/Savanna Heights includes direct-vent fireplace with marble surround, plaster ceilings and walls, bathroom wood vanities, separate tub with jets in master bathroom, chrome light fixtures, security system, 42-inch maple kitchen cabinetry, kitchen pantry, Kenmore appliances and much more. Chesapeake is a vastly diverse city that represents many facets of the population of Virginia. When people move here, they essentially move up because they are gaining so much. Golfers can take their time getting to each of Cahoon Plantation’s 18 holes. This course mixes native scenery with lush landscaping to highlight the green fairways. Pack a lunch, grab the whole family and head over to Bells Mill Park. Enjoy a picnic together and know that the simple things are sometimes the best things. When browsing through houses for sale in Hampton Roads, be sure to have a checklist ready. New construction homes can please the wallet and every member of the family. Choosing the right piece of real estate can be an exhilarating experience. If you’re lucky, you could wind up with a new home in Madison Gardens/Savanna Heights. Send me more information about communities similar to Madison Gardens. Our agents gladly offer FREE property tours of Madison Gardens, Chesapeake and homebuyer consultations to all serious buyers.